Welcome and prepare to discover science through the amazing world of Superheroes ! Join us for a unique event showcasing the mind- boggling wizardry and the technology behind comic books' legendary heroes and villains. You won't be disappointed and you might even get to meet your favourite superhero at Esplora! 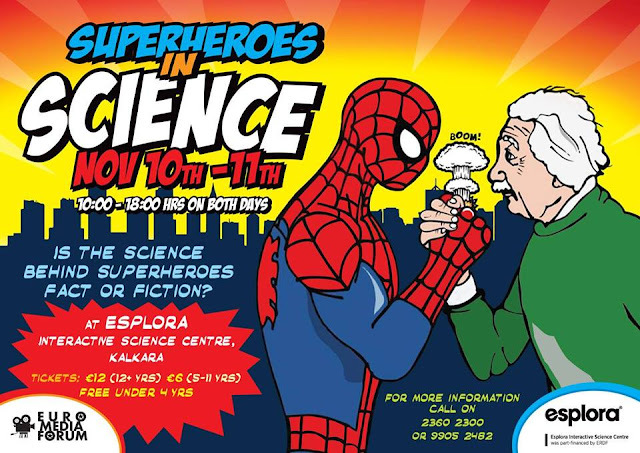 Now, more than ever, cutting-edge science belongs to the world of Superheroes and this jam- packed weekend guarantees thrills and activities for all ages. You will get to experience fantastic science shows, dioramas, life-size figures of the most popular characters - perfect for selfies, a Superhero digital art exhibition, fun hands-on workshops, Superhero vs Super villain duels and much more. Keep an eye out for popular characters such as Ironman amongst the visitors ; marvel as Wonder Woman practices her awesome sword moves; paint a stellar constellation and even solve the Riddler’s enigmas!! Tickets can be purchased on the day of the event or beforehand from the Esplora reception, Kalkara. This ticket will include access to all the exhibits.